Practice a range of camera words with this classic board game! We’ve updated it with a phonics twist! It works well as a one on one, or phonics rotation activity. Download and print the Snakes and Ladders Board game here, or photocopy page 179. of The Synthetic Phonics Toolkit Part One. Choose a selection of camera words to write in the blank spaces on the board. Laminate your board game if you wish to use it as a repeated activity. NOTE:Have the students colour in the board game as a reward. 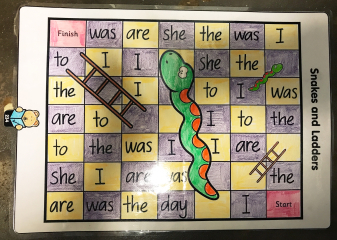 Each child must put his or her counter on the space that says ‘start’. Take it in turns to roll the dice. Move the counter the number of spaces shown on the dice, moving left of the ‘start’ square. The child must read the camera word featured on the square out loud, to remain in that place. If the counter lands at the bottom of a ladder, move up to the top of the ladder. If your counter lands on the head of a snake, slide down to the bottom of the snake. The child who reaches the ‘finish’ square first, wins. NOTE:This resource can be used for both Kindergarten and Year 1. You can make the game as hard or as easy as you like, depending on the camera words you choose to include.